Stan Grant’s Australian Dream | Me fail? I fly! The essay is framed as a commentary on a speech Stan Grant gave a little over a year ago, at an Intelligence Squared (IQ2) debate staged by Sydney’s Ethics Centre. The speech was unrehearsed and unscripted because, Grant says, he wanted ‘to look the audience in the eye and hold them’ when he talked about Aboriginal exclusion from ‘the Australian dream’. Surprising no one except Grant himself, it went viral. (If you’ve missed it, here’s the video). Beginning with the text of the speech, which he tells us he hadn’t previously seen written down, Grant observes that commentators tended to focus on the parts of the speech that fit the litany-of-horrors version of Aboriginal history. He refers us to a dozen writers – historians, novelists, song writers – who have told the horror stories of continuing dispossession, exclusion and brutality, and takes as his subject the contributions that Aboriginal people have made to Australia society, the prospects for a better world. He doesn’t disown the horror stories – far from it – but he sets out to tell ‘a more complete story of the dynamism and potential of Australia and its first peoples’. And one day, I want to stand here and be able to say as proudly and sing as loudly as anyone else in the room, Australians all let us rejoice. The essay turns on the hinge of that sentence: while acknowledging the devastation that has been wrought on Aboriginal peoples and the continuing bleakness of many Aboriginal lives, it argues that substantial change is happening and the future could be bright. It doesn’t quote William Gibson, ‘The future is already here, it’s just not evenly distributed,’ but it could have. 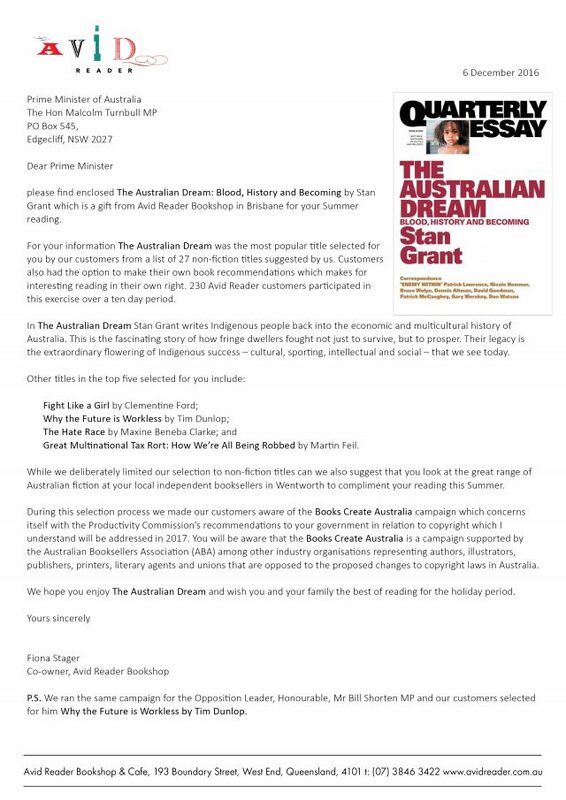 Grant takes issue with W E H Stanner’s view that Aboriginal culture – the Dreaming – is essentially unchanging and timeless, so cannot survive contact with the market. He backs his argument with beautifully told stories of his great-great-grandfather, great-grandfather, grandfather and father, each of whom responded to devastating invasion and continuing dispossession with creativity, resourcefulness, courage and wisdom, and each of whom made significant contribution to the broader Australian community – as workers, soldiers, teachers, family men, communicators. The Indigenous experience bends and shifts with the growth of the country. In the midst of catastrophe, Aboriginal people were adapting to this utterly foreign intrusion. The survival and resilience of the descendants of the people of the Australian frontier should be seen as part of the pioneer mythology of this country. At Federation the Indigenous people were assumed to be dying out and would not be counted among the numbers of the Commonwealth. Now Australian law acknowledges native title, Indigenous people sit in our parliaments, and Indigenous art, music and dance have a unique, treasured place in our national culture. We may have rubbed uncomfortably against each other, but together we have enlarged the idea of Australia. ‘We may have rubbed uncomfortably against each other’ must be a contender for all-time world champion understatement. But Grant knows what he’s doing. He insists that the monstrous treatment of the young men in detention in the Northern Territory should not be treated as emblematic of a homogeneous Aboriginal experience. Without denying the bad stuff (‘those tyrants who reduced talk of genocide to a whisper in Europe find their equivalent in those who deny atrocity here’), he argues that to narrowly identify Aboriginality with victimhood plays into the oppression: he calls this the ‘identity trap’. He rejects ‘reliance on a narrative of historical grievance and exclusion’. It’s a nuanced, passionate, courageous essay. Like Chimamanda Ngozi Adichie, Stan Grant writes about the danger of a single story. He would agree with Rebecca Solnit (whose Hope in the Dark I’m now reading), that despair can be unrealistic, that hope and the recognition of change are necessary and realistic. I look forward to reading what some of the people on those lists have to say in the correspondence section of Quarterly Essay 65. The correspondence up the back of this issue deals with Don Watson’s The Enemy Within. It went to press before the US presidential election, and bristles with assumptions that Hilary Clinton would win. It’s interesting reading all the same. Added later: Lisa Hill has an excellent review at her blog ANZ LitLover’s LitBlog, which quotes liberally. This entry was posted in Books, Housekeeping and tagged Quarterly Essay, Stan Grant. Bookmark the permalink. Pingback: David Marr’s White Queen | Me fail? I fly!